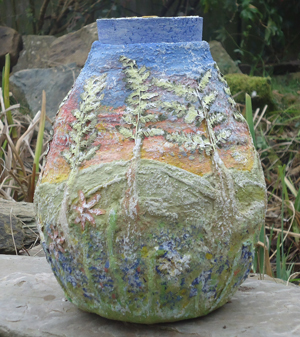 This urn sets the scene of a landscape at the end of the day - sunset colours in the sky above the hills, trees and woodland flowers in the foreground. The hills and trees are set in relief on the surface of the urn. The urn is decorated with chalk, earth pigment, paint, ferns and wild flowers. There are wild flowers adorning the lid. For home display I will cover the surface with a matt varnish to seal the leaves and wild flowers in place. If being interred, this varnish coat will not be needed.